Adjustable canopy, you can adjust it in different weather. Detachable handrail, you can detach it and replace a food tray. Big shopping basket and wallet bag on the bottom of the bassinet ensure you to go out for shopping with your baby. One-foot braking mechanism and flexible front wheels with 360 degree rotation make it easy for you to control the whole stroller. Cool in Summer once you roll up the 3 curtains, warm in Winter once you roll down all curtains and zip foot cover. Shipping Service: The item ships from MA or CA by UPS, USPS, FedEx or is fulfilled by Amazon. 2-6 days delivered except for Weekends. ATTENTION PLEASE: It is a standard baby stroller not a lightweight stroller so it cannot be carried on airplane. 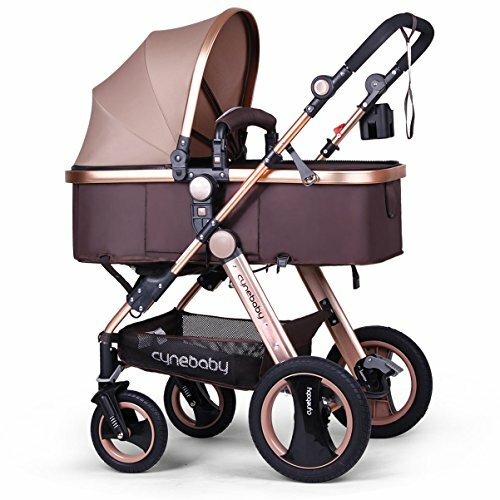 GOLDEN APPEARANCE: Luxury golden frame, brown soft lycra canopy and brown Oxford bassinet bring you a feast of vision. Give your baby a gold carriage stroller. 0-6 months old can sleep in the bassinet, 7-36 months old can sit in the golden carriage when you change the bassinet into a seat position. UNIQUE SAFETY DESIGN: Focus on every little detail to ensure your baby's safety. Anti-shock springs in front wheels absorb shock when pushing the stroller on rocky places. 12-inch ax-shaped rear rubber wheels ride easy on all roads. This all terrain newborn carriage with all of the advanced safety design passed the American ASTM F833 safety standard test. FANTASTIC MULTI-FEATURES: An infant bassinet baby carriage can be a toddler seat stroller. The sleeping bassinet can be adjusted into a seat position, baby sits upright or semi-recline. Convertible stroller make it possible for baby to face parent or face outdoor scene. Adjustable handlebar meet the demands of people in different height. HEAVY-DUTY MATERIAL: Wearable and more durable rubber wheels is bike-like but free-inflation. Eco-friendly and anti-bacterial fabrics are not easily torn or punctured. Anti-rust aluminum alloy frame is stable because of its triangular structure. Non-toxic first class PA plastics are not easily oxidized or cracked. A good city select foldable stroller. PROMISE and GUARANTEE: 180-day 100% money back if you are not satisfied with it. Lifetime warranty, any after-sale or maintenance please fee free to contact us, we try our best to resolve it asap. Every stroller equipped with stroller accessories like stroller food tray, warm foot cover, cup holder, safe stroller wrist strap, baby seat cushion, mosquito net. If you have any questions about this product by cynebaby, contact us by completing and submitting the form below. If you are looking for a specif part number, please include it with your message.